There are a number of children’s books initially published with modest expectations, which then blossomed into franchisable pop culture phenomena causing million dollar windfalls for their authors and publishers. The Little Engine That Could, Madeline, Cat In The Hat, come quickly to mind. In most instances the first edition book for each franchise sells for considerable bucks in the book collecting marketplace – the underwhelming original expectations (i.e. under printed) as compared to the successful reality. Because of this unexpected, but long-lived popularity, a multitude of collectors are chasing a constrained supply of first edition books. There was no such constrained supply for the original issue of Rudolph The Red-Nosed Reindeer, with Montgomery Ward giving away over two million copies of the book to their shoppers during the Christmas of 1939. The original issue was in comic book-like format, with soft cover wraps. Giveaways being what giveaways be, most of the two million copies were read, read again and again, received wear, tear, torn covers, torn pages, then discarded, many copies serving their patriotic duty during the WWII paper drives. A small proportion of the two million giveaways have survived to today’s collectible book market. Both the 1939 and 1946 softcover giveaway copies pre-date the Rudolph franchise phenomena. Rudolph firmly took root in our collective conscious with Gene Autry’s 1949 bestselling Christmas ballad, which has become a holiday classic. The highly successful 1964 stop-motion children’s movie cemented Rudolph in our popular culture, and the 30 minute made for TV film is the longest running consecutive year TV perennial. Every Christmas season sees a number of the surviving Rudolph softcover books surface to auction on eBay, often in tattered worn and torn condition. More often than not, the Rudolph being offered is the 1946 version rather than the 1939 first issue. A very good copy of the 1939 first issue should bring $200 to $300, while a very good copy of the 1946 issue should bring $10 to $20. This first issue is almost comic book in form, bound in glossy red paper wrappers. The book measures 10-1/4 x 7-1/2 inches, and has 32 pages plus wrappers. 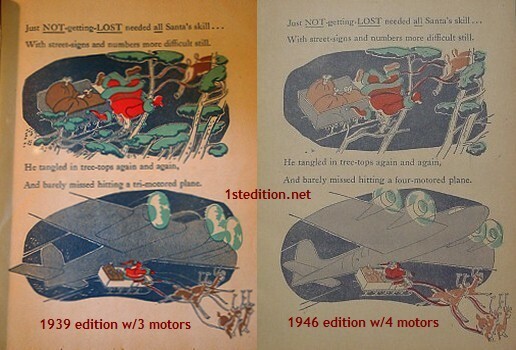 The 1939 first edition Rudolph the Red-Nosed Reindeer can be identified by the tri-motored airplane on page 9. The 1946 edition has a four-motored plane. The first Rudolph booklet, with illustrations by Denver Gillen, was distributed to two and a quarter million Montgomery Ward customers during Christmas of 1939. Although quite popular, it was not released again until 1946 due to wartime paper shortages, but by the end of that year, a total of six million copies had been distributed nationwide. It was in this form that Rudolph first became an icon for wartime Christmas celebrants and a lucrative marketing tool for Montgomery Ward. It made little money for May, however, until 1947, when he persuaded Montgomery Ward president Sewed Avery to transfer the copyright to him. Robert L. May’s prototypical creation was commemorated in 1990 with the publication of a handsome facsimile edition–the first time the story had been offered for sale in its original form. St. James Encyclopedia of Popular Culture, 2002 Gale Group. In 1939 Montgomery Ward published 1000 hardbound copies in a gift box as a giveaway to their executives and suppliers. The 1939 hardbound copies are very difficult to find. TLETC, CITH, and Madeline first editions copies routinely sell for $1000+ in today’s book collecting market place. In the past, we’ve written about the factors affecting the collectibility of a children’s book.